Semifinals were in full-swing on Monday night's "Dancing with the Stars," which featured choreographer Kenny Ortega as a guest judge and a major surprise. Meryl Davis and her pro-partner, Maksim Chmerkovskiy, clearly were feeling some jitters before their routine. Davis said, "You're making me nervous," to which Chmerkovskiy replied: "That's because I'm nervous." Apparently, they had no need to worry -- the judges were over the moon about their routine. "That was fantastic!" said Ortega, while Bruno Tonioli called it "impeccable." They received perfect scores all around. The pair impressed again when they hit the floor a second time for a Viennese waltz. Amy Purdy and Derek Hough also didn't disappoint. Not only did they receive a surprise call from Oprah Winfrey, but the dance couple earned rave reviews from the panel. Tonioli said his jaw was "dropping on the desk." Need we say more. They nailed it with an almost perfect score of 39. They followed suit with their second number -- a jazz dance. Ortega said, "You redefine choreography for a new generation." After James Maslow did the cha cha with Peta Murgatroyd, Ortega described it as "electrifying," while Tonioli called it "effortlessly cool and yet on fire." Another perfect score. They took on "Islands in the Stream" for their second dance, which garnered mixed reviews. The pair ended up with 36 points for that one. Charlie White and Sharna Burgess hit the floor for a foxtrot. Carrie Ann Inaba called it "brilliant." They received a perfect score of 40. Ortegea critiqued the second dance, saying it lacked a little funk, but still -- Len Goodman said White "deserves to be in the finals." They walked away with 36 points. Candace Cameron Bure and Mark Ballas tackled a Viennese waltz that didn't go over too well. Goodman pointed out a few mistakes and Ortega said Bure got a little lost. They received 34 points. In the end, the final three were Purdy, White and Davis. 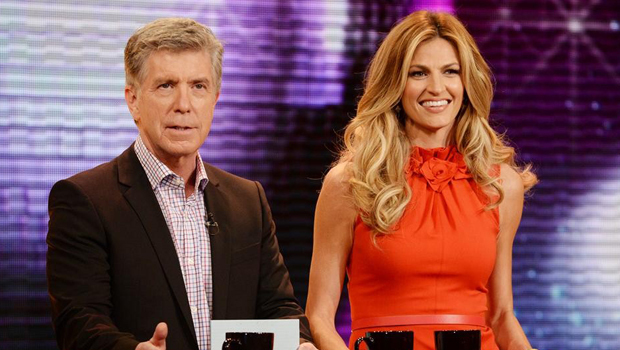 "What's about to happen is arguably the biggest shock of the season -- of many seasons," co-host Tom Bergeron warned. White and Burgess were sent packing. "Our judges are shocked. I'm shocked," said co-host Erin Andrews. "All these people are so deserving," said White. "From start to finish, it's been an amazing journey...Now I can 100 percent be a cheerleader -- Team Meryl -- love you." Burgess added, "I love him ... He's taught me so much about positivity." It's down to the wire now. The "DWTS" finals take place Monday, with the finale next Tuesday. Tell us: Who do you think will win "DWTS"?